The 15 Best Restaurants in Iowa! There’s no lack of great restaurant options in the state of Iowa. From fine-dining to country fare, Iowa has everything between downtown dining and lunches in the alley. If you’re a food aficionado, or just like a tasty bite, go ahead and put these 15 best restaurants in Iowa on your list. It’s hard to say what makes the experience of visiting the Ladora Bank Bistro just that, an experience. While it could the full wine and beer selection coupled with shared-plate menu items like be shrimp scampi crostini and Moroccan lamb meatballs, it’s also the unique ambiance that adds a lot of experience to your visit. Located inside the historic Ladora Savings Bank, this restaurant also shares space with the old vault, and the classic revival architecture at it turns out, it’s a great space to grab a bite. Whether you are looking for a patented pie shake or an all-American breakfast, look no further then this Iowa City institution for a delicious meal. While it’s the menu items like the Iowa breakfast and bison burgers that keeps this cozy diner open and busy year-round, it’s the 80+ years of service that gives Hamburg it’s intrinsic Iowa City status. Writers, politicians and every college student who has attended the University of Iowa has ordered from the menu at Hamburg Inn, and you could be next. Take a dash of Southern home-cooking, add a little pinch of Tex-Mex and Cajun, stir in some fresh ingredients and you’ll get a taste of Dixie Quick’s in Council Bluffs. Whether it’s all-day breakfast favorites such as cactus scramblers and huevos rancheros, or lunch and dinners specials like blackened catfish and chilaquiles, there might be a few rules to follow while visiting Dixie Quicks, but the food is worth the small requests for timelines. The Des Moines culinary scene has really blossomed out over the last decade, and leading that charge is the East Village taco shop, Tacopocalypse. Offering fresh, street-style tacos, this centrally located eatery is surrounded by the electric East Village neighborhood and offers such tasty items as bacon chorizo and potato poblano tacos. If you happen to be in the area on a Sunday, be sure to stop into Tacopocalypse for their Brunchpocalypse menu including burritos and biscuits and gravy. The Canteen Lunch in the Alley of Ottumwa started out as a five-stool restaurant in 1927, and has really kept the tradition of simple, delicious food ever since. The menu includes the famous loose-meat sandwich that is the actual namesake Canteen Lunch, as well as shakes, floats and slices of pie. See for yourself why the Canteen Lunch in the Alley has stuck around for so long, and why they’re going to stick around for years to come. While the pizza is reportedly famous at Angelini’s in Keokuk, it’s really the other fine dining they offer that makes this restaurant stand out amongst the rest. Baked pastas, authentic salads, homemade breads and chef specials to the liking of grilled ribeye and bella salmon, don’t misinterpret the message, the pizza at Angelini’s is worthy of the title famous, but you might want to spend some extra time perusing the menu at this above-average pizza joint. Frittatas, roasted beef BLT paninis and beef medallions, whatever time of day you stop into Café Indigo of Davenport, you’ll have plenty of options to drool over. 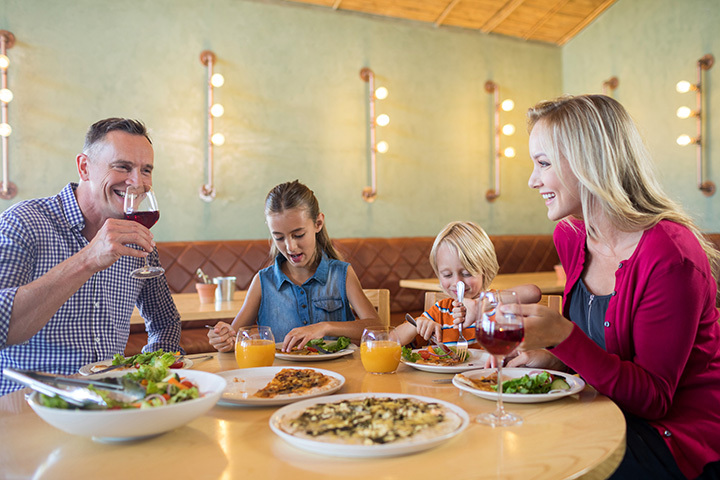 The fun doesn’t stop with the main meals at Indigo however, and to follow nicely or tag along with your meal is a full beverage menu and tantalizing fresh dessert options. Couple it all with a cozy atmosphere with big windows, and Café Indigo could soon be your next favorite restaurant in Iowa. For a truly fine-dining and fantastic meal experience, Proof in downtown Des Moines can exceed your expectations. Proof has the awards, recognitions and waitlist to prove it, but you really can’t comprehend your total Proof experience until you sit down in the modern dining area and order the full courses of a fine-dining experience, then you can see why Proof is evidence towards the capacity of a great meal. While many nightlife options offer plenty of Irish-themed atmospheres, for a truer experience check out the Irish Shanti in Elgin. Home to the famous Grunderburger, a hand-pattied, one-pound burger made with locally-raised beef, besides this monster of a burger, The Irish Shanti also has a whole menu of delicious entrees including pork loins and boiled cod, and of course, Guinness is always on tap. It seems every college campus needs a great spot to get a casual bite, and for Iowa State University in Ames, The Café is it. Simply named, with a full breakfast, lunch and dinner menu available, plus a long list of deli sandwiches made fresh-to-order, the Café exceeds all expectations of an all-day spot. Enjoy the food, enjoy the atmosphere and just know that one visit to The Café will never be enough. With a menu featuring Long Island duckling, pumpkin lasagna and a “You’re in Dubuque Pizza” complete with Applewood smoked bacon, spicy Italian sausage, mushroom and onion, suffice it to say, L.May Eatery won’t leave your appetite upset. Located on the recently renovated historic 1000 block in Dubuque, this charming dining spot doesn’t lack in ambience either, and with a full wine selection, everything about L.May Eatery seems to pair together nicely. The best way to deal with a zombie apocalypse is with a thick milkshake and burger that you can barely fit in your mouth. That’s Zombie Burger’s method at least, and if it’s true, then this creatively-themed Des Moines restaurant has what you need. With amazing flavors of shakes including chocolate Nutella, marshmallow, and Zombie Joe (vanilla ice cream and jet fuel coffee syrup), and mountainous burgers that will make your mouth water as you order, do yourself a favor and check out this relatively new Des Moines staple burger joint. Even if you are not a beer or cider fan, you will find plenty of things on the menu at Backpocket Brewing in Coralville to enjoy. That’s because coupled with their delicious craft beers (try Gold Coin if you enjoy a lager), this gastropub also has an amazing outdoor patio space where you can order food such as bacon leek dip and pork belly bites appetizers, or partake in a specialty brick-oven pizza made-to-order. Whatever drink you choose, something on the menu will pair nicely with it at Backpocket Brewing. Touted as Iowa’s oldest food and drinking establishment, since 1852, six generations of Breitbach’s have operated Breitbach’s Country Dining, serving thousands of customers from Iowa and beyond. While the community of Balltown has helped keep Breitbach’s in business, it really is the home-made, always fresh food that keeps people coming back to their tables. Check out their weekend buffet menus for an authentic large-portion, family-dining experience. For a rootin’-tootin’ good time head on down to The Twisted Tail Steakhouse & Saloon in BeeBeeTown. A great pit stop on a motorcycle ride, a fun place to catch some evening entertainment and a family-friendly stop for all ages, the Twisted Tail Steakhouse & Saloon is not only made famous by the fun that can be had there, but the menu of iconic American classics goes a long way too. smoked baby-back ribs and Famous Philly’s, if you’re ever about BeeBeeTown, don’t forget to check out The Twisted Tail Steakhouse & Saloon.